Here is an example of a close combat resolution that we did not have room for in the rulebook. It shows an assault launched from a moving transport. During the American maneuver phase, an experienced halftrack unit A (card US-08) is allowed two actions. It is carrying two experienced American infantry units B and C (card US-18) as passengers. The player decides to conduct a close assault against a suppressed veteran German infantry X (card GE-44) which is not equipped with a panzerfaust. The German infantry is in the open and is not dug-in. The halftrack conducts a move action and halts within 1" of X, and declares a close combat. In the second action, its' two passengers dismount within 1" of X and also declare close combat. 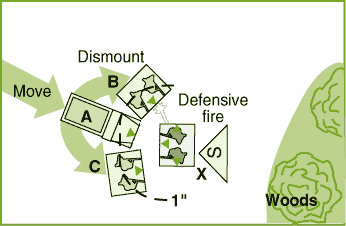 In the defensive fire phase, X can only choose 1 target. It is not equipped with a Panzerfaust and decides that the best attack will be against one of the infantry units. It chooses B as its target. Examining its unit card, it finds that at a range of 0-2", it has an has a basic attack modifier of +2 against T class units. Examining the Discipline rating chart for its class (Veteran) and order status (suppressed), it finds that its discipline rating modifier is -1. Finally, examining the modifiers for direct fire, it finds that no other modifiers apply, so its net modifier is +1. It rolls a 5 modified to 6. Cross-referencing the die result of 6 with B's discipline class of "experienced" shows that the defensive fire suppresses B. Each of the units involved in the combat rolls a single die. Examining the UDC, we find that X has a close combat modifier of +1 against V class targets and +2 against T class targets (numbers in red). Because it is under attack by both types, it must use the smallest modifier (+1). Also, as a suppressed veteran, it has a discipline rating modifier of -1, for a net modifier of 0. It rolls a 6. A determines that its' close combat modifier is +1 vs T class units and its discipline rating modifier (experienced/good order) is 0. It rolls a 4. B has a close combat modifier of +2 and a discipline rating modifier of -1 (experienced/suppressed). It rolls a 6 modified to 5. C has a close combat modifier of +2 and a discipline rating modifier of 0 (experienced/good order). It rolls a 7 modified to 9. The best of the American die rolls (9) is compared to the German's die roll (6) for a differential of +3. The American wins the combat. 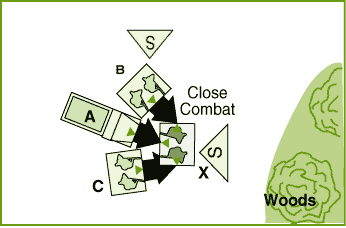 Examining the Close Combat Table shows that X must abandon its position and the American player seize the vacated location. X must move directly away from the combat until it moves its full 4" movement distance or reaches cover. In this case, cover is 3" away so it stops and conforms to the edge of the woods facing the enemy. Its order status is changed to DISORDER. The U.S. player must seize the position. B is moved into the position and rotates so that it is facing X. This ends the combat.